Cosmonaut Mikhail Kornienko spoke to TIME mMagazine along with NASA aAstronaut Scott Kelly Thursday (Sept. 15), where they discussed their year-long mission in space. Space travelers don't have to dream of flying, but Cosmonaut Mikhail Kornienko, up on the International Space Station, revealed his own bad dream of missing the flight back to space in a recent televised interview. 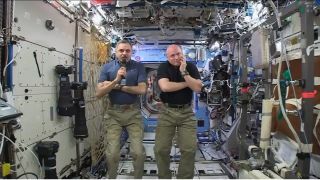 Kornienko and NASA astronaut Scott Kelly are halfway through their one-year mission living on the space station, and they took the time to talk remotely with TIME magazine Thursday (Sept. 17), discussing life on the station and what they miss about home. "But it's a dream," he added. "I'd like to go to Earth, but exactly in scheduled time." Kornienko also fielded a question about his sleeping arrangements — he's staying in the U.S. section of the station, as he did on his last stay five years ago. He still spends most of his time working in the Russian segment, he said, but there are only two sleeping areas there; the two other cosmonauts stay on that side, while he rooms within the U.S. section. The International Space Station currently has six crewmembers aboard, which is exactly how many individual rooms there are for sleeping. Back when there were nine people aboard, from Sept. 4 to Sept. 12, the three newly arrived spacefarers brought sleeping bags into their own, smaller modules. Two of those three new arrivals headed back to Earth after just over a week, as did one of the cosmonauts who arrived in March with Kornienko and Kelly. But the interviewing duo are in it for the long haul. "For me, time on the station is like rubber," Kornienko said. "It's much, much longer than in Earth. But I am glad I am here with Scott, my friend — and a very good crewmember — and I'm sure all the tasks will be performed OK and we will do our mission very well." This year-long mission is Kornienko's second career spaceflight; in 2010 he worked on the International Space Station for almost six months.